As "American Darts" at least in German usage a soft darts version is known which is played on automats with only one bull instead of the usual two bullrings. Actually American Darts is a special steel-darts version played in the USA. This American steel-darts version was created in America already around 1900. Till now it's not known how it developed. One can assume from what is known that immigrants from Great Britain, mainly from Ireland, brought with them their wooden boards and darts around the turnaround from the 19. to the 20. century. The Americans then developed an own standard game known as baseball or 1 to 9. Till today American Darts is played in some areas. There exist tournaments and leagues. Baseball - which is one of the most long-standing American sports and probably developed from the forerunners of the English cricket - was already wide spread at that time in North America and the rules were common knowledge. It is almost natural that the game and its rules were transferred to the dartboard. 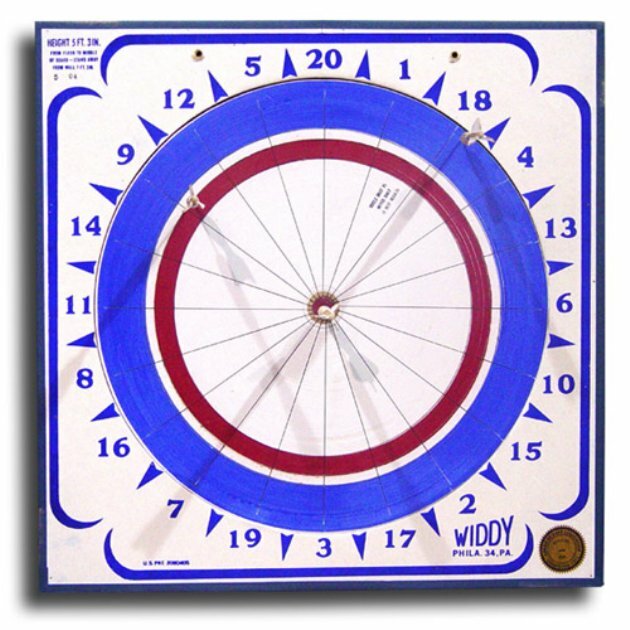 As baseball the darts game is played in nine Innings - the segments of the dartboard even have a similarity to a baseball field. Till today American Darts is played on wooden boards often from basswood. The basswood is either only varnished or painted white. The numbers are painted on the wood. The numbering is the same as on the British dart boards. The design is slightly different and is called "Paddle Wheel Board". The arrangement is totally different. The middle of the board is either varnished or white and has a red Bullseye in the centre which is only used to decide who'll start to throw. Around this white or varnished centre is a red ring, then a very narrow white or varnished ring follows. After this we've got a blue outer ring. The different parts of the board are divided by very thin embedded wires. The blue outer ring is not used in the match but at a "good" board you can turn the inner parts with it to prolong the durability. Often you can use both sides of the boards. The white or varnished inner part of the boards are the singles segments and all hits in there count one point, the red ring are the doubles and hits count two points while the narrow varnished or white ring is the triple ring and hits count three points. 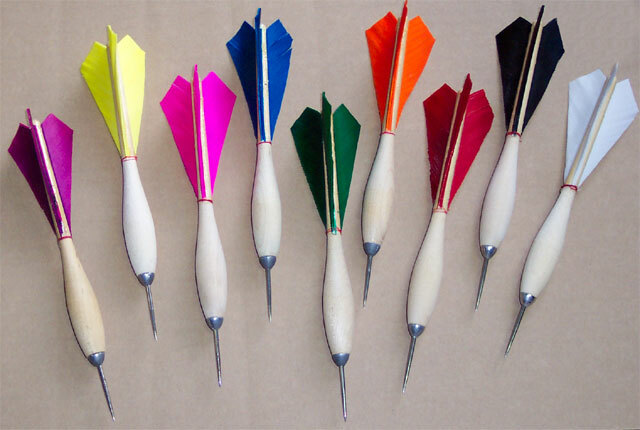 American Darts is played with darts with wooden barrels in which a steel point is fixed. Usually the flights are real three winged feather flights. Some barrels have got a lead centre. The standard darts are 5 ¾ inches long and are known as number 1 darts. The weight lies between 12 and 14 gram. The centre of gravity lies due to the steel point in the front of the dart. The shafts are from wood as well. Colour and shape of barrel and flights differ depending on the manufacturer. "Baseball" is only played on the segments 1 to 9. Should the match be a draw after nine innings a tenth inning is played on segment 10. One of the strongholds of American Darts always was Philadelphia were most of the manufacturers till today have their headquarters. Till today Apex and Widdy produce American Darts and American Dartboards. Only Deco doesn't exist any more. The name "Widdy" is an abbreviation of the last name of the founder and till today American darts are often called "Widdy's". How popular the sport once was tell us some data known from Widdy's. 1937 Widdy's produced 2500 darts every day, all in handiwork, and the corresponding number of dartboards. 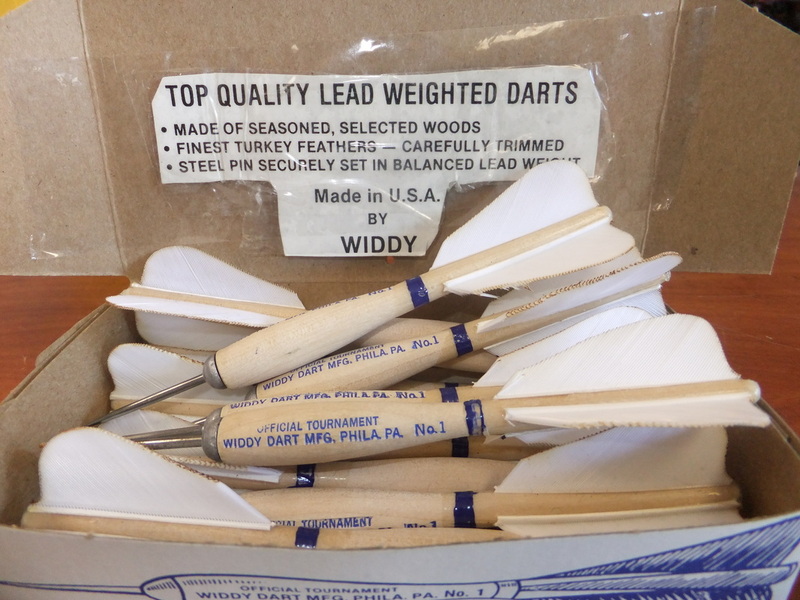 1943 over one million Widdy darts were shipped to the American soldiers in World War II. It took till the years around 1960 before the British 501 game together with British immigrants and soldiers came to the USA and started to displace American Darts. But the greater danger for "American Darts - and by now British darts as well - are the soft-dart machins which are very popular in the USA.